Hannah sweet potatoes are medium to large in size and are bulbous, oblong, and cylindrical in shape with rounded to tapered ends. The semi-smooth skin is light tan and has many shallow eyes scattered across the surface. When raw, the flesh is firm, cream-colored, and dense, transforming to a drier, flaky but creamy consistency with a yellow hue when cooked. Hannah sweet potatoes are slightly sweet with a dense, starchy texture similar in consistency to a traditional white potato. Hannah sweet potatoes are available year-round. Hannah sweet potatoes, botanically classified as Ipomoea batatas, are a white, dry-fleshed variety that is a member of the Convolvulaceae or morning-glory family. Also known as the Sweet Hannah and the Yellow Hannah sweet potato, Hannah sweet potatoes grow in warm temperate climates and are similar in texture to a traditional white potato, often be used as a substitute for the tuber. Hannah sweet potatoes are favored for their starchy texture and mild, sweet flavor are used in a wide variety of cooked applications to enhance consistency and flavor without overpowering the dish. Hannah sweet potatoes contain vitamins A and C, fiber, potassium, and iron. Hannah sweet potatoes are best suited for cooked applications such as stir-frying, pureeing, mashing, baking, deep-frying, stuffing, and steaming. The roots can be sliced, grilled, and served with cilantro, a squeeze of lime, and peppers for a zesty sweet flavor, sliced and coated in mirin and honey and sautéed, or they can be cooked and mashed as a side dish. Hannah sweet potatoes can also be baked into a casserole, made into gnocchi, cooked into pies, roasted in cubes, or sliced into wedges and fried to make a crispy French fry. It is important to note that when slicing, Hannah sweet potatoes should be prepared quickly as the skin will oxidize from the oxygen in the air. To partially prevent this process from occurring, the roots can be stored in acidulated water as they are sliced to keep their yellow-white hue. Hannah sweet potatoes pair well with pumpkin, leeks, kale, bell pepper, mushrooms, ginger, garlic, onions, chives, shallots, tomatoes, meats such as poultry, ham, pork, bacon, and prosciutto, nuts such as pecans, peanuts, chestnuts, and pistachios, and herbs such as basil, cilantro, dill, sage, and tarragon. The roots will keep 2-4 weeks when stored in a cool, dry, and dark place with good air circulation. 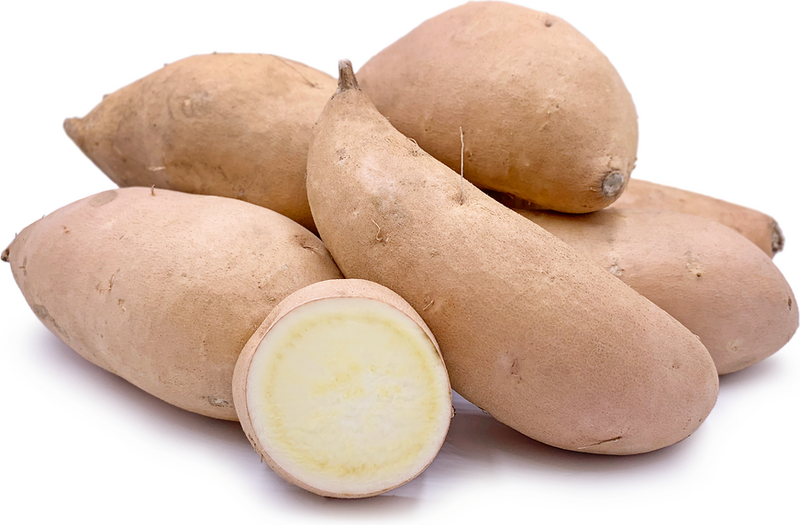 White-flesh sweet potatoes are some of the most recognizable varieties worldwide and were the first sweet potatoes to be commercially cultivated in the United States in the 16th century. Today sweet potatoes have seen a recent increase in popularity in the health food market for their nutritious attributes, but despite their notoriety, white-flesh sweet potatoes have slowly decreased in availability and are harder to find in American supermarkets than their orange counterparts. Orange sweet potatoes were introduced in the mid-20th century under the name yams and were quickly adopted as a staple ingredient in traditional southern cuisine. These brightly colored roots are currently dominating the commercial market due to social media, as they are largely being discussed in health food blogs for their high beta-carotene content. White-fleshed sweet potatoes, like the Hannah, are still favored for their milder, unobtrusive flavor and ability to be used in both savory and sweet applications, but since the American market thrives off of social media platforms to disseminate information, these sweet potatoes are not gaining as much recognition via food blogs causing them to be shadowed by other highlighted varieties. Sweet potatoes are native to South or Central America, but the true origin has not been clearly identified as early evidence can be found in multiple regions of tropical America. The roots were then introduced to Spain and the rest of Europe in the late 15th century via explorers, and to Asia and the United States in the mid-16th century. While the exact origins of when the Hannah sweet potato was created are unknown, the variety is often found at farmers markets and specialty grocers in the United States. The Hannah sweet potatoes pictured in the photo above were found at a local market in Miami, Florida. Recipes that include Hannah Sweet Potatoes. One is easiest, three is harder.